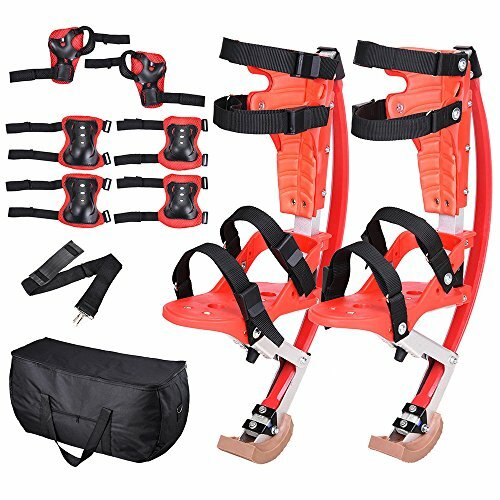 AMPERSAND SHOPS Skid-Proof Junior Jumping Bouncing Kangaroo Stilts Shoes Exercise Sports Gear with Protective Wrist Elbow and Knee Pads Plus Carrying Case by AMPERSAND SHOPS at Scruffs Game. Hurry! Limited time offer. Offer valid only while supplies last. These Junior Jumping Stilts Bouncing Kangaroo Shoes have a 66 to 110 lbs. weight capacity. They are also affordable and are ideal for beginners. These Junior Jumping Stilts Bouncing Kangaroo Shoes have a 66 to 110 lbs. weight capacity. They are also affordable and are ideal for beginners. This set comes with kneepads, elbow pads, and wrist pads for protection. · Please note that these jumping stilts are should not be used by children under 10 years of age. · Children who are using this product must have an adult present to supervise at all times. · A safety helmet must be worn at all times while using this product.